Lens Description: The Schneider 150mm f/5.6 Apo-Symmar L Lens is a standard, all-purpose large format lens which gives the highest image reproduction quality possible in a broad range of applications. This lens is for use with 4x5 cameras.rnrnThe 75° angle of coverage permits generous shifts on the 4x5 format, which is very useful in architecture photography.rnrnThe 150mm Apo-Symmar L uses 58mm filters and weighs just 9.4 ounces. 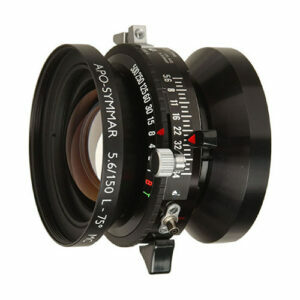 It is an ideal everyday lens for users of 4x5 large format cameras.